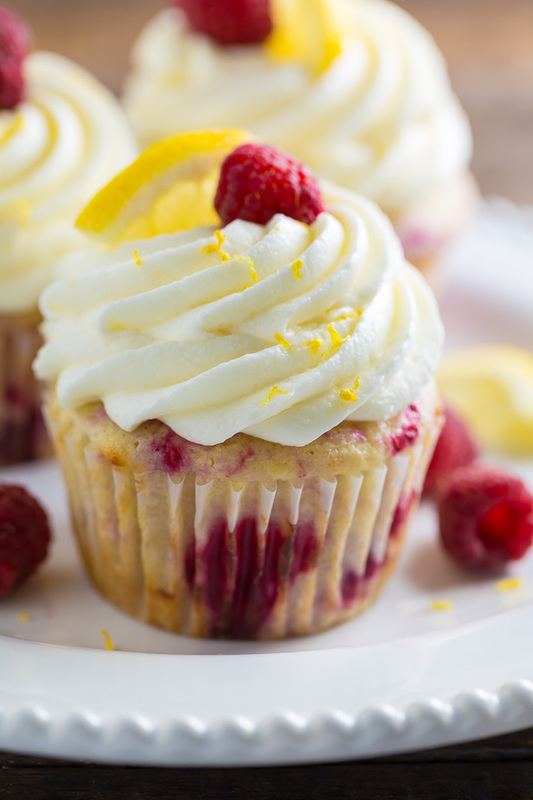 Lemon Raspberry Cupcakes. 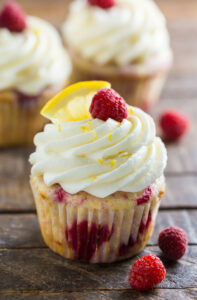 Very similar to this Lemon Raspberry Cake… but cuter! TGIF! What are your weekend plans? Are you doing anything fun and Summery?! Because I leave for Paris in 6 days, it’s a work weekend for this girl. My goal is to shoot 6 new recipes and hopefully even get a little editing done. That way I have plenty of new stuff to tempt you with while I’m eating my way through the city of light (or as I like to call it, the city of wine and cheese). Did I tell you I’m even taking a baking class over there? I can’t wait to come home and share what I learn with you. I also need to start packing… but knowing me I’ll leave that for last minute and then have a complete meltdown. C’est la vie! But let’s talk about why you’re really here: dessert! 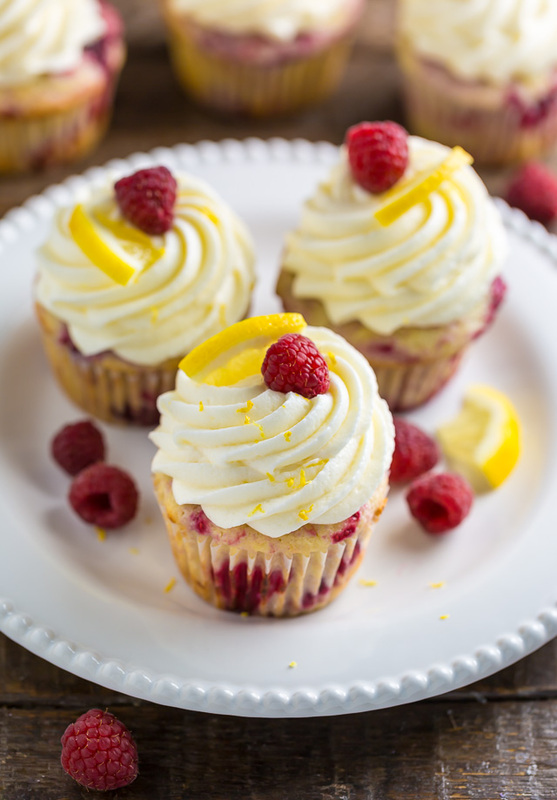 More specifically, these luscious lemon raspberry cupcakes. They’re sweet, tangy, and bursting with juicy berries in every bite. I love them! And I know you will, too. When you measure your cake flour, be sure you’re not packing it into the measuring cup. Packed flour yields dense and dry cupcakes. 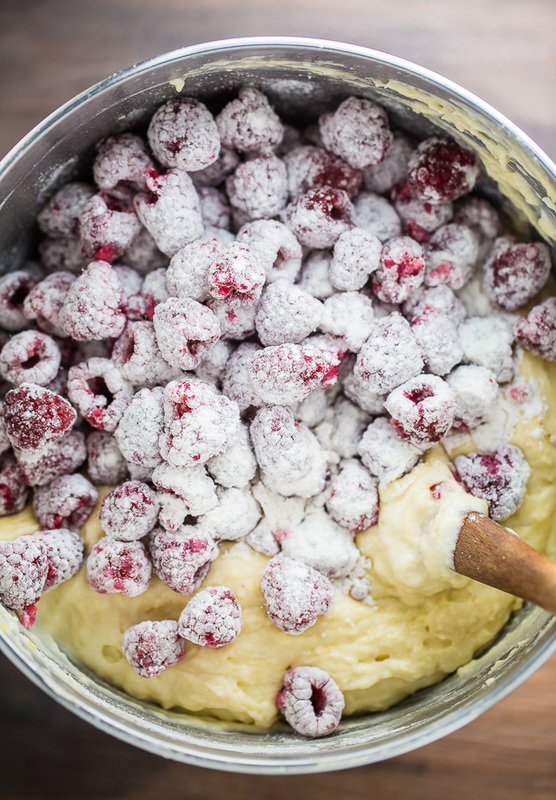 You must toss the raspberries in flour before adding them to the batter. This dusting of flour helps keep the berries afloat during the baking process, and ensures you won’t bite into a cupcake full of sunken berries. Feel free to use fresh or frozen raspberries for this recipe. If you use frozen, don’t thaw them first. I don’t recommend using extremely large berries, which can cause the cupcakes to collapse or sink in the middle. So if you see any gigantic ones, just set them aside for another use. Also, don’t add more berries than called for. This too can cause the cupcakes to sink. For the lemon cream cheese frosting, you’ll want to make sure your butter and cream cheese are both VERY soft before you make it. Because I wanted a potent lemon flavor, I call for lemon zest, lemon juice, and lemon extract in this recipe. I love Watkins pure lemon extract because it’s 100% natural, doesn’t contain any artificial flavors, colors, or additives, and just tastes like pure lemon. Moist and fluffy Lemon Raspberry Cupcakes! Line 2 cupcake tins with paper liners; set aside. In the bowl of a stand mixer fitted with the paddle attachment, or in a large bowl using a handheld electric mixer, beat the butter, vanilla extract, lemon extract, sugar, and lemon zest on medium-speed until light and fluffy, about 2 minutes. Add in the eggs, one at a time, beating well after each addition. On low speed, beat in the sour cream, then the milk. Turn mixer off. Add in 3 and 1/4 cups of the cake flour, baking powder, baking soda, and salt. Use a fork to lightly toss the dry ingredients together. Using a rubber spatula, gently fold the dry ingredients into the batter, mixing just until combined. Be sure not to over mix here or your cupcakes will be dense! Set aside. In a small bowl combine the remaining 3 tablespoons of flour with the raspberries; toss to coat. Using a rubber spatula, gently fold the raspberries and any excess flour into the batter, stirring just until combined. Spoon batter into prepared cupcake tins (filling each mold 3/4 of the way). Bake one pan at a time, for about 22 minutes, or until a cupcake tester inserted in the center of a cupcake comes out clean, or with just a few moist crumbs attached. Cool in the pan for 10 minutes then transfer cupcakes to a cooling rack. Cool completely before frosting. In the bowl of a stand-mixer fitted with the paddle attachment, or in a large bowl using an electric handheld mixer, beat the cream cheese, butter, and lemon extract on medium-high speed until completely smooth; about 2 minutes. Reduce the speed to low and gradually add the sifted confectioners' sugar. Add in the lemon juice and zest. Once incorporated, increase speed to medium-high and beat for 1-2 minutes. Once the cupcakes have completely cooled, spread or pipe the frosting on top of the cupcakes. 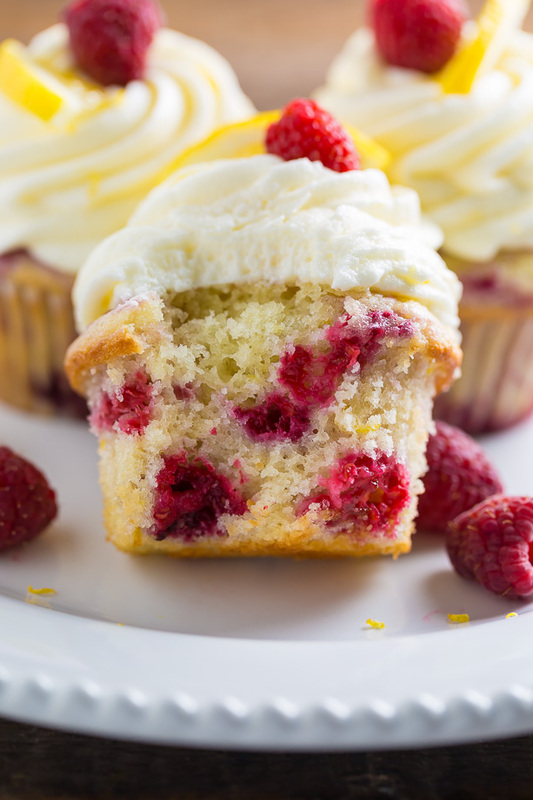 Decorate with fresh raspberries and a lemon slice, if desired. Cupcakes are best the day they are made, but will keep, covered and stored in the fridge, for 3 days. Bring to room temperature before serving. Very nice cupcakes and very summery! I would like to prepare ones. Thank you for the amazing recipe. Do you think I can use gluten free flour? Can I substitute raspberry for strawberry? Strawberries will bake up more gummy than raspberries, so I don’t recommend it. I noticed your lemon blueberry cupcake uses a different cake base, with all purpose flour and an extra egg yolk. 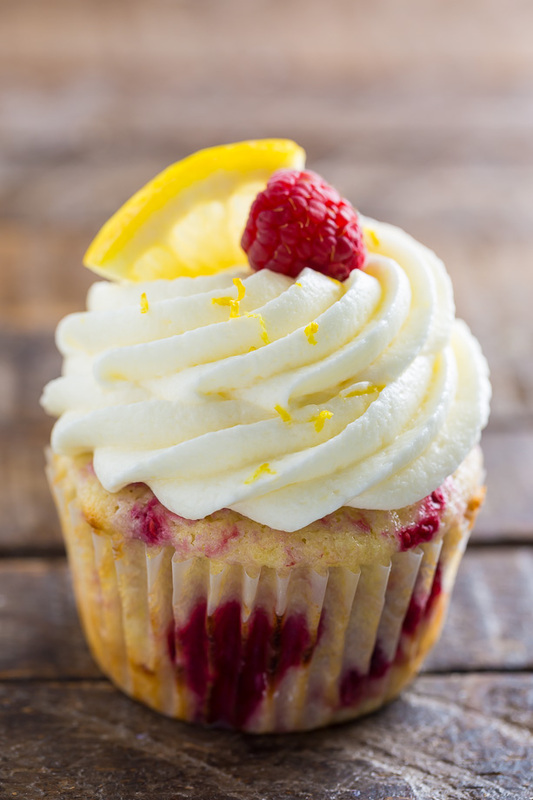 Is there a particular reason you chose that cupcake base for the blueberry lemon and this one with cake flour for the raspberry lemon? Thanks! Hi Mary. They’re both delicious! Blueberries are a little heavier than raspberries, so I went with a sturdier batter for that recipe, and a more delicate one for this. And I forgot to I ask, is one or the other clearly your favorite now between those two options? They both look amazing! Can you believe that I don’t have even one cupcake recipe on my site? Although I love them, my frosting skills need some work! These cuties look gorgeous, Ashley! 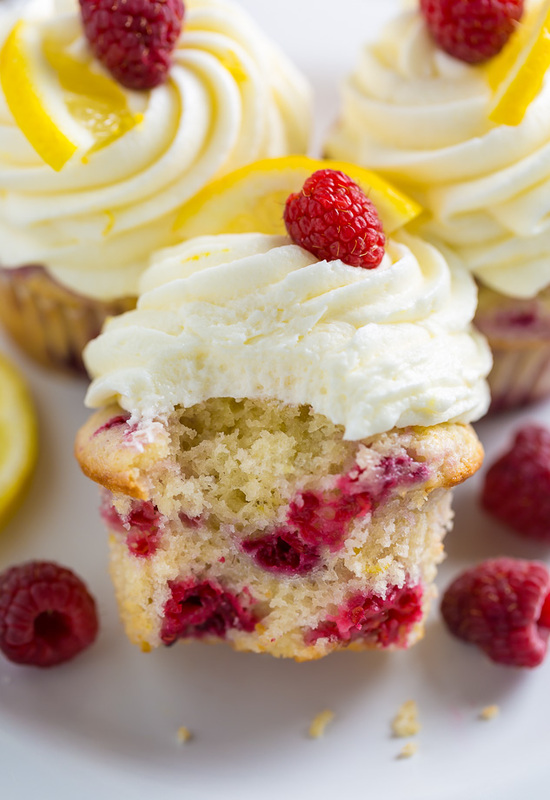 I love the light flavors from the lemon and raspberry frosting. This just screams summer! My husband and I loved it..Really delicious!! Thank you!! Would this recipe work just as well for mini cupcakes? I am looking to make these as minis. Do you sugggest chopping the raspberries slightly? im planning on making mini’s- would anything change? I made these and they were absolutely delicious!! Wanted to make them again but we’re now onto blueberry season, just wondering if you think it’d be safe to make the berry swap and keep the recipe the same? Do you need to use cake flour or can you also just use regular flour? Yes, you need cake flour. Is this recipe adjusted for altitude? If not what changes do you recommend for +5000ft? Can this be made into a cake? Hi what piping tip did you use for these cupcakes? These turned out wonderful! We love them! How do I post a pic? I made it and it was great! Thank you! Can you freeze these cupcakes unfrosted? Tried this today, though I don’t have any lemon extract nor lemon zest ~only lemon juice, it worked out great! My boyfriend really love it! Cake flour does really makes a difference. 🙂 Thank you for this recipe! When I make the frosting it comes out really runny even after adding an additional cup of powdered sugar. I’m not sure where I’m going wrong. This has happened twice now. It tastes great but I can’t pipe it on my cupcakes. I’m really bummed! It sounds like your butter may be too soft. When using frozen rasberries do you still toss them in the flour while they are frozen?